Whether you have a one-person business or are running a multinational services firm, you probably have some clients that are more trouble than they are worth. They don’t pay enough, or don’t pay on time. They are constantly demanding more of your time and generally being a pain in the neck. Especially in a less-than-booming economy, firms are hesitant to “fire” their clients. So, let me ask you this. It is now June, almost half way through the year, is your business on track to meet its 2011 financial goals? If so, congratulations! You rock, and your coach must be very proud. If not, you are probably still fabulously awesome, but take five minutes to try this exercise. Or don’t, it’s up to you. If you are fine with profits, costs and morale continuing the way they have been, thanks for reading thus far, and I’ll see you next month. Next, make a chart and rate your best three clients on a scale of one to five, assessing how well each of them meets this criteria. 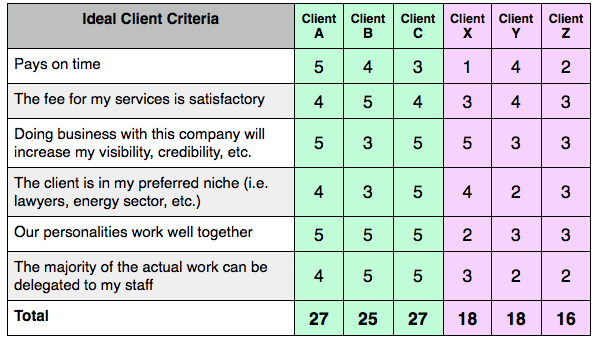 Then rate three of your least favorite clients. See the chart below as an example. Once you have created your own chart you will start to see patterns. This is a simple but multifaceted tool. When I work with clients, we may use this to create some long-term business development goals, identify areas for individual and organizational development, design a simple system for deciding which clients to accept and under what conditions, etc. Even without a coach, you should be able to use this to clarify priorities, figure out which areas require improved communication, and simply determine which clients you are better off without. While this tool is designed for insight, of course the real results don't come without action. If you have created a chart and next steps are unclear, or if actually moving forward seems challenging, give me a call and I'll help you sort it out.